At IslandGirlz Designs we are always amazed by the things people discard. The challenge is in discovering the beauty and functionality in these cast-offs. IslandGirlz Designs gives new life to old books, maps, game pieces, bullet casings and other "trash" as part of our effort to preserve and protect our planet for future generations. 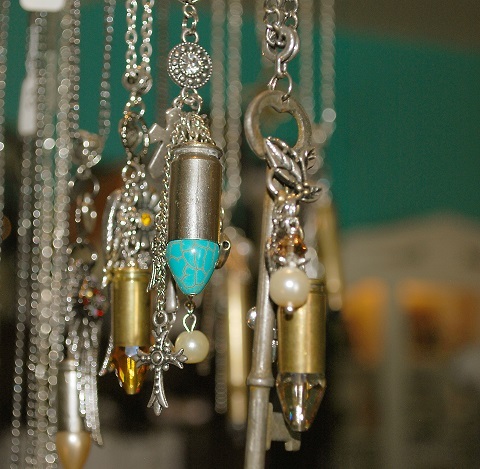 Each and every finished piece incorporates a recycled component which is often the focal point of an individual design. Years ago I started out in the craft business out of necessity as a single mom of two sons. Upcycling everyday items into wearable and functional art came naturally, born out of the need to get as many uses out of things as possible while spending the least amount of cash! It was empowering when I realized people actually wanted to buy my designs! Back then, just as it is today, my designs are inspired by so many things. First and foremost, I am a child of the '70s and still have that mentality that everyone should take the opportunity to make a difference in the world. Upcycling "trash" is my way of trying to reduce our carbon footprint on the planet. I want my grandson to enjoy all the natural wonders the world has to offer. Secondly, I am my father's daughter. He was the ultimate recycler even before recycling became politically correct. My father was raised during the Great Depression and was the third youngest of ten brothers and sisters. I think he invented the words reuse, recycle and repurpose! I remember the many walks I took with him which really translated into picking up aluminum cans! Now I smile whenever I think of how proud he'd be to see what I create out of "trash". These days creating wearable and functional art from recycled items has become a true passion. IslandGirlz Designs invites you to share in this passion with one of our unique designs! !